Crossways Hotel a Victorian hotel in Pickering, UK. A Victorian house in Pickering which has been carefully restored over the last few years to its former elegance, and has private walled garden with parking facilities at the rear of the hotel. Crossways has a private walled garden with parking facilities at the rear of the hotel. Ensuite bedrooms also feature radio alarm, colour television, hairdryer, bathrobes, tea and coffee making facilities. We have six individual double rooms en-suite. 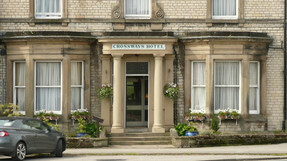 Accommodation and breakfast from £80.00 for two people. Private Parties and Weddings catered for. Restaurant 10 to 34 covers. 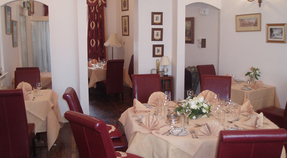 Pauline and Paul are only too happy to provide menus to suit your occasion and budget.